Aspen Group Holdings Sdn Bhd’s RM400mil Tri Pinnacle project will be the first affordable housing scheme on Penang island with a high quality ambience. Its chief executive officer Datuk Manokharan Murly said the project, located on a 4ha site in Mount Erskine in Tanjung Tokong, was open to first-time house buyers registered with the state government. It will be launched in the fourth quarter of 2014. Tri Pinnacle will have 390 units of 650sq ft low medium-cost (LMC) apartments priced at RM72,500 and 859 units of 800sq ft affordable condominiums priced at RM299,000. Murly was speaking to reporters after signing a RM95.5mil Islamic loan facility with Malaysia Building Society Bhd (MBSB). Also present were MBSB President and chief executive officer Datuk Zaini Othman, MBSB chairman Tan Sri Abdul Halim Ali and Aspen Group chairman Datuk Seri Nazir Ariff. Murly added that the state government would expedite the approval process of genuine applicants to buy the condominiums. The MBSB loan facility will be used to defray the cost of the freehold site for the Tri Pinnacle project, according to Murly. “We are here to dispel the common negative perception associated with LMC and medium cost (MC) developments which usually suffer from shoddy architectural design and quality, lack of facilities and security,” said Murly. “Tri Pinnacle will stand out as an attractive spot to work and live. “Landscaping, designed with vertical gardens, plays a prominent part in the scheme. “It will create a natural buffer between the adjoining roads and car park podiums, and mitigate the heat effect,” he said. Murly said the project would be designed with a 24-hour two-tier security access system. There will be an elevated garden, a swimming pool, a basketball court, gymnasium, BBQ pits and children’s playground. 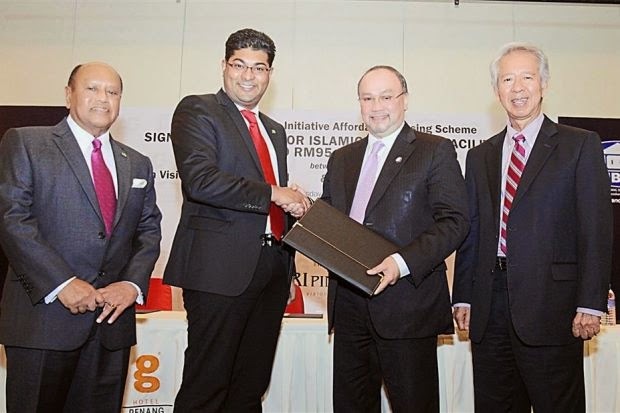 Meanwhile, Zaini said the collaboration enabled the company to be part of a vibrant project that would contribute to Penang’s property development sector. “Other than providing financing facilities to Aspen Group, we will also extend an attractive financing package to its home buyers.